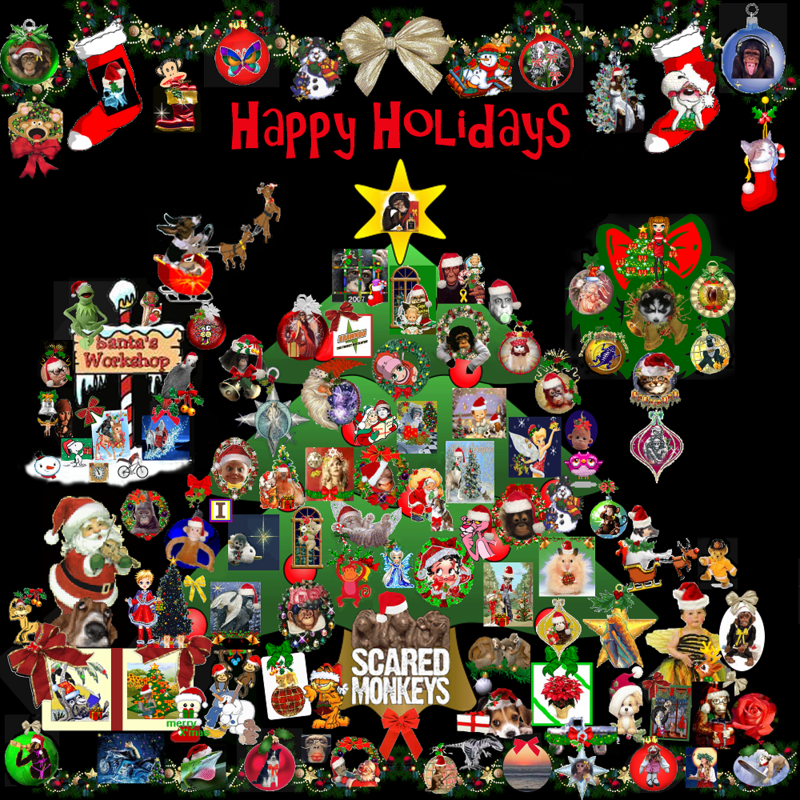 Merry Christmas - Blast from the past! Shoot, I don't remember how to upload a photo. Well, Rob Smith and his wife are celebrating their marriage. I forget how long they've been married, but it's substantial. On FB right click and copy image address to paste here - highlight and click on insert image icon. Three clips from an interview with Dave from October. Probably irritates the Aruban authorities too, since they were more than likely telling the truth for once. How ironic is that?!!! Dr. Oz: What does Beth not understand about your intentions with the search for Natalee's remains? Dave Holloway: You know, I have no idea, I've not talked to her about it other than the fact we had a discussion when dna was needed and we spoke for quite some time about that and she was very willing to give that to finally hopefully get closure. Dr. Oz apparently did a show with Dave and TJ too, but I haven't found a recording of it anywhere yet. Peru has rejected a request from Joran van der Sloot to be able to serve his sentence due to qualified manslaughter on a Peruvian girl in the Netherlands. He has not yet paid a fine of about 50,000 euros, writes De Telegraaf. Van der Sloot now collects money for that fine and hopes for a second chance. If the fine was paid, he would be eligible for the return scheme. According to De Telegraaf, he recently transferred from the very isolated and elevated Challapalca prison to the somewhat lower Juliaca. That place is also in the south of Peru, there is also a cold mountain climate. The prison is overpopulated. According to De Telegraaf, Van der Sloot has to share his cell with fourteen others, while the cell is meant for six people. Van der Sloot has a sentence of 28 years because of the manslaughter on Stephany Flores. He made a request through the Dutch embassy in the context of a WOTS scheme (Transfer of Execution of Penal Sentences Act). Van der Sloot would receive a sentence converted to Dutch law of a maximum of 18 years. He would then also be able to use the conditional release scheme, which would shorten his sentence by a few years. He has been in Los Angeles for 8.5 years since the murder of Flores in May 2010. Incidentally, there is another investigation into money laundering by Van der Sloot's wife. If he himself was suspected or convicted in that case, he can not claim a WOTS decision for the time being. A criminal prosecution wanted by the United States for facts in the case of the girl who disappeared in Aruba, Natalee Holloway, is separate from the WOTS regulation. The US can request its extradition both in the Netherlands and in Peru. Thank you Texasmom, the sweetest person I know. Keeps on getting worse and worse for him. LIMA - Joran van der Sloot is under attack from justice in Peru. The murderer of Peruvian woman Stephany Flores, condemned to 28 years in prison, is suspect in a new criminal investigation into money laundering. Van der Sloot, along with his girlfriend Leidy, would have squeezed three and a half tons of criminal money. Van der Sloot received that amount from the suspicion thanks to a Dutch henchman, who lit online casinos with an ingenious system. According to justice in Peru, Joran's girlfriend and mother of his child, Leidy Figueroa, mainly profits from criminal profits. The woman, who comes from a poor neighborhood in Lima, now lives in a spacious apartment in a luxury district of the Peruvian capital. Joran van der Sloot, who is also still suspected of the disappearance of Natalee Holloway in 2005, denies everything. Joran van der Sloot, who is serving 28 years in prison for murder in Peru, has again worked hard in the nests. Justice in the Peruvian capital Lima accuses him and his girlfriend Leidy of having laundered $ 350,000 and wants to prosecute the couple. BIRMINGHAM, Ala. (CN) – A federal judge denied a motion by Oxygen Media and Brian Graden Media to dismiss a suit alleging they intentionally inflicted emotional distress upon Natalee Holloway’s mother and committed fraud when they acquired her DNA during their six-part series investigating her daughter’s disappearance in Aruba. On Monday, Chief U.S. District Judge Karon Bowdre denied the motion to dismiss brought by the companies that produced “The Disappearance of Natalee Holloway.” In a 26-page memorandum opinion, Bowdre said Natalee’s mother, Beth Holloway, “sufficiently alleged facts” that make her tort of outrage complaint plausible. In the opinion, Bowdre wrote it was plausible Oxygen and Brian Graden Media acted with actual malice and thus their series and the articles they published are not protected by the First Amendment, even though Beth Holloway is a public figure. In Holloway’s amended complaint filed July 2018, she asked the court to award her $20 million in compensatory damages and $30 million in punitive damages. Natalee Holloway’s 2005 disappearance from a senior class trip to Aruba attracted international media attention. According to Holloway’s original complaint which was filed February 2018 in the U.S. District Court for the Northern District of Alabama, “The Disappearance of Natalee Holloway” aired in 2017 and was billed as a true-crime documentary. However, Beth Holloway alleged the show was scripted and lied about details of Holloway’s disappearance. According to Bowdre’s opinion, Holloway argued the show’s producers were told the bones that they acquired in Aruba were animal remains but told her they discovered human remains when they asked for a sample of her DNA. In a statement to Courthouse News, Taylor Wilson, partner at Atlanta-based L. Lin Wood P.C. praised the “well-reasoned decision” that came down in favor of his firm’s client. Since the judge issued the opinion, both sides will begin increasing their discovery, according to Wilson. Attorney Harlan Prater IV wrote in the motion to dismiss brought by Oxygen and Brian Graden Media that a 2011 Supreme Court case involving Westboro Baptist Church showed that the First Amendment is a defense against claims of intentional infliction of emotional distress. Lead attorney for Oxygen and Brian Graden Media, John Thompson, Jr. of Birmingham-based firm Lightfoot Franklin & White did not immediately return a request for comment Tuesday afternoon. This is awesome news! So thankful Beth's case is moving forward! Wood confidentially settled a $750 million defamation suit against CBS and secured a favorable order in Alabama in an ongoing case against Oxygen Media. Atlanta libel lawyer L. Lin Wood said he notched a settlement against one television network and a preliminary win against another over TV specials featuring unsolved crimes—cases that he said should serve as a warning to other media companies. In civil cases associated with two of the most sensational unsolved crime mysteries of the past two decades, Wood on Jan. 4 consummated a settlement agreement in a $750 million defamation case against CBS and on Jan. 7 secured a favorable ruling from an Alabama judge who refused to dismiss a fraud and outrage case against cable crime network Oxygen Media. Wood confirmed that he reached a confidential settlement with CBS in a 2016 defamation case he filed on behalf of Burke Ramsey, the older brother of slain 6-year-old child beauty queen JonBenét Ramsey. 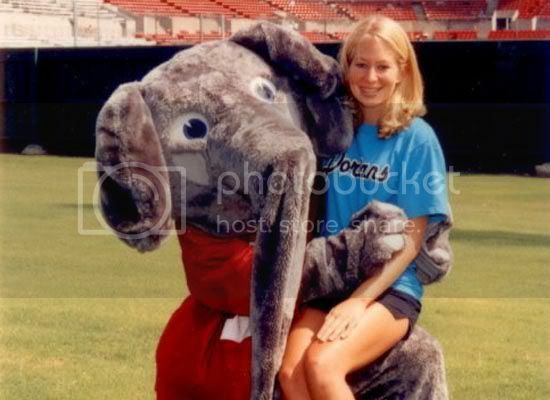 In Alabama, Wood represents Beth Holloway, the mother of 19-year-old Natalee Holloway, who disappeared during a high school trip to Aruba in 2005 and whose body has never been found. Wood filed the Ramsey and Holloway lawsuits after the networks revisited JonBenet’s slaying and Natalee Holloway’s disappearance in multipart television retrospectives intended to appeal to a growing audience for sensational crime stories. “In an era of fake news, in continually deteriorating discussions of issues on social media and the Internet, these cases are vitally important to send a message to the public that there are lines you cannot cross without being held legally accountable,” Wood said. In the Alabama case, Chief Judge Karon Owen Bowdre of the U.S. District Court for the Northern District of Alabama denied Oxygen Media’s motion to dismiss Holloway’s fraud and outrage claims stemming from the cable network’s alleged ruse in securing her DNA in 2017 by leading her to believe her daughter’s missing body had finally been found. An outrage claim, while extremely limited, allows for the recovery of damages for emotional distress that was either intentional or reckless and so severe that no reasonable person could be expected to endure it. Oxygen Media lawyers John Thompson of Birmingham, Alabama, firm Lightfoot Franklin & White, and Cameron Stracher of Westport, Connecticut, could not be reached for comment. Wood said he sued on Holloway’s behalf after she was persuaded to supply a DNA sample, allegedly because a friend of a suspect in her daughter’s disappearance had produced bone fragments that were supposedly her daughter’s from an Aruba burial site. In reality, the fragments were from a boar’s head, according to the complaint. “They failed to disclose who had discovered the bones, that the Aruban authorities had declared the bones to be animal bones or that Beth’s DNA would be used on television,” Wood said. “I don’t believe there is any mother of a missing child who ever gives up hope that her child will be found or, at least, her body will be discovered,” Wood said. “Every mother clings to the belief, however slim or however long, that her child will be found.” To “dangle the prospects in front of Natalee’s mother that they may have found Natalee’s body and then to solicit her DNA” constitutes “the type of outrageous, egregious conduct that civilized society cannot and should not tolerate,” Wood said. "The folks doing these true-crime series need to adhere to the first word: true," says L. Lin Wood, the Atlanta attorney whose firm represented both the Ramseys and Beth Holloway. "If they want to suggest conclusions or make accusations, then they better damn well be sure they've got facts, not exaggerations." Hi Monkeys! I’m still, and always, checking in. This post is from 3/11/2018. Should’ve heard more by now. Leidy Figueroa Uceda, wife of the Dutch Joran van der Sloot (31), sentenced to 28 years for the murder of Stephany Flores in 2010, could also end up in prison. The reason is that the Office of the Money Laundering Prosecutor of Lima would request his arrest in the investigation for the crime of money laundering that he faces together with the father of his son, who is being held in the Challapalca prison in Tacna. Both are investigated for allegedly having laundered 350 thousand dollars. It was learned that Figueroa Uceda has been summoned to testify before the Prosecutor's Office on several occasions, but apparently has not come. The investigations of this case began after a chain of casinos denounced Joran van der Sloot and another Dutch citizen for fraud. According to this company, the murderer and his compatriot manipulated the games, earning large amounts of money. Part of those amounts would have been deposited to the account of Figueroa Uceda, who after marrying Joran proceeded to buy a luxurious apartment and two cars, the latter two sold for $ 17,000. However, the aforementioned property does not appear registered in the National Superintendency of Public Records on behalf of the European's wife, but on behalf of a third person. Only the two vehicles registered with their identity. - Joran van der Sloot met his victim, Stephany Flores, at a Miraflores casino in 2010. He then took her to a hotel, where he beat her to death and stole her belongings. - They believe that he moved 350 thousand illegal dollars with his partner, who acquired a luxury apartment and two cars. A leopard doesn't change his spots! I hope his wife gets prison too, then they can have something in common. Listen. Three women who’ve dealt with heartache and grief will talk about “What Horses Can Teach Us” during a luncheon March 8 at The Club. The 11 a.m. event will feature Beth Holloway, mother of Natalee Holloway; Jaycee Dugard, who was abducted at age 11; and Rebecca Bailey, a psychologist who helps survivors of traumatic crimes. They’ll discuss their experiences and the ways horses can be used as therapy. Tickets for the luncheon are $125; proceeds benefit The Red Barn and the JAYC Foundation. “What Horses Can Teach Us,” March 8, 11 a.m.-1 p.m., The Club, 1 Robert Smith Drive, $125, $900 for table for eight, benefit for The Red Barn and JAYC Foundation. LEEDS, AL (WBRC) - The Red Barn in Leeds is a lot more than just a horse farm. The work that happens there everyday with horses is transforming the lives of children and adults who have physical disabilities or special circumstances. O’Neal said one child she has enjoyed watching come into her own over the past few years is a little girl who was born blind and has a cognitive impairment. By working with horses, that little girl is now doing things other children her age can’t do, which O’Neal said is amazing to watch. According to O’Neal, this little girl’s story is just one of many she witnesses everyday. O’Neal said horses are great for children and adults physically because of the balance, strength, and coordination it takes to ride them. 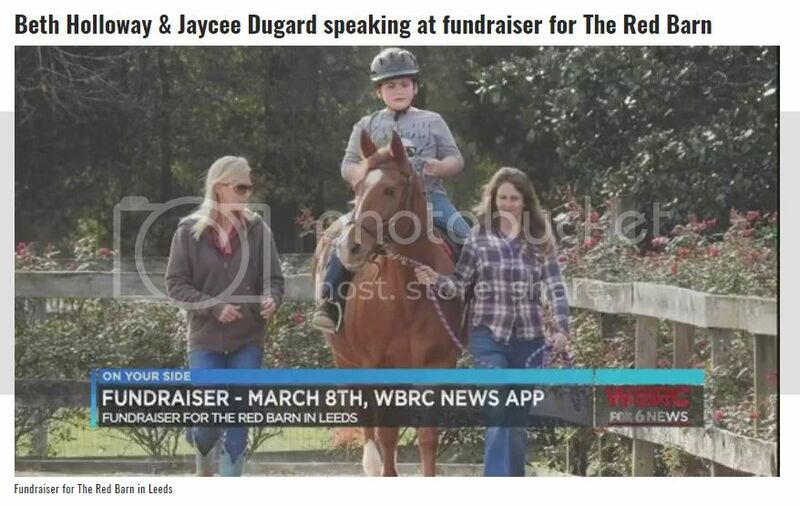 On Friday, March 8, The Red Barn is holding a fundraiser luncheon called “What Horses Can Teach Us” between 11:00 a.m. and 1:00 p.m. at The Club in Birmingham. Beth Holloway, Jaycee Dugard, and Dr. Rebecca Bailey are among the main speakers. Holloway, whose daughter Natalee disappeared in 2005, will be talking about the role horses have played in her life. "Horses have really kind of shaped her life and gave her a lot of the perseverance and grit she needed to get through some of the most difficult things that any parent can imagine, and that’s the loss of your child,” said O’Neal. Dugard has also used horses to help her overcome traumatic experiences in her life. In 1991, Dugard was 11 years old when she was abducted while walking from her home in California to her school bus stop. She was imprisoned for nearly two decades before she was freed in 2009 at the age of 29. 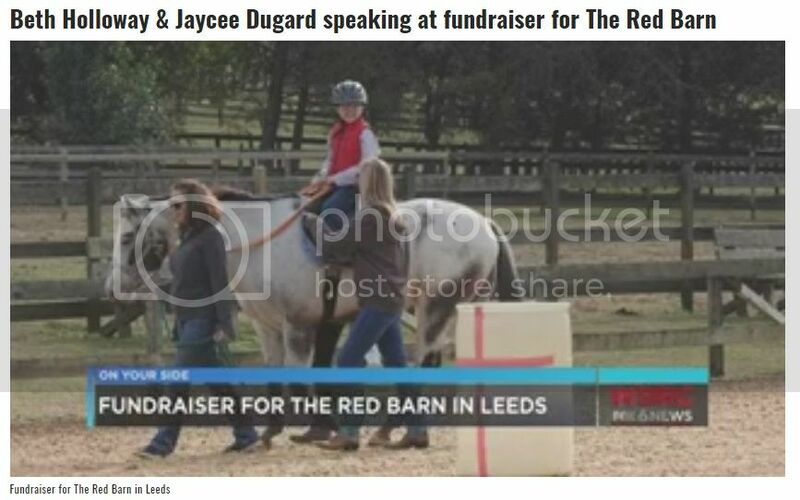 Part of the money raised by the luncheon will go to The JAYCE Foundation, founded by Dugard. “In my own life, I have seen horses transform myself, and how I think about my own relationships with others," said O’Neal. That’s why she believes the stories that will be told at “What Horses Can Teach Us” are so important for people to hear. "Just that ability to know and connect with an animal is something that’s amazing, and we’re just so blessed to be able to give children that opportunity,” said O’Neal. If you are interested in attending the luncheon, O’Neal said the sooner you get your ticket the better. You can find out more information by going to theredbarn.org. Gwinnett County District Attorney Danny Porter has taken the extraordinary step of asking a local judge to recuse herself from more than 400 criminal cases being prosecuted by his office. Porter argues that the judge’s claims that he hacked her computer — and the GBI investigation that her subsequent actions triggered — raise questions about her ability to be impartial at the bench. Porter vehemently denies having tried to access Superior Court Judge Kathryn Schrader’s computer. The filing last Friday asking Schrader to be removed from all current and future cases brought by his office is just the latest twist in a complicated saga that also involves convicted child molester Ed Kramer, the co-founder of Atlanta’s popular DragonCon convention and a longtime Porter nemesis. That GBI investigation is focused not on Schrader’s original hacking fears but on her purported actions in response to those fears — and whether or not they resulted in giving several unauthorized individuals access to the county’s larger computer network. Those individuals include Kramer, whose unrelated Feb. 26 arrest brought the Schrader situation to the attention of Porter and other investigators.Kramer was arrested after allegedly taking a photo of a 7-year-old boy at a local doctor’s office several days earlier. In addition to new charges, he was accused of violating the probation still in place following his 2013 conviction on multiple counts of child molestation. A post-arrest search of Kramer’s home computers found a file labeled with Schrader’s name, Porter said. “The idea that he would be allowed anywhere near the computer network of the courts, it’s just appalling,” Porter said. According to court filings submitted by Porter and Kramer, Schrader hired private investigator TJ Ward in February to look into concerns that someone — perhaps Porter — was attempting to remotely access her work computer during non-business hours. It is unclear why Schrader suspected the district attorney. Porter said the original issues with Schrader’s computer were nothing nefarious and were resolved by the county’s IT department. But Ward had a man named Frank Karic install a monitoring device to Schrader’s county-owned computer. Ward then tasked Kramer — whom he has employed as a computer forensic analyst — with keeping track of the activity. Ward worked as a private investigator for the defense team in Kramer’s original child molestation case. Kramer has also claimed he helped Ward during his work with an Oxygen channel TV series about the disappearance of Natalee Holloway. In a motion to have Porter recused from his new criminal case, the oft-litigious Kramer contended that he had found “clear signs of … exploitive activity” on Schrader’s computer and was preparing a detailed analysis of his findings before he was arrested. Kramer, who has been exiled for years from the popular sci-fi DragonCon festival he helped found, implied that Porter had him detained because of his work on Schrader’s behalf. Porter said his office wasn’t even aware of that work until Kramer’s computers were seized. GBI spokeswoman Nelly Miles confirmed Monday that the agency’s investigation “into allegations of unauthorized access into the Gwinnett County network” began on March 11. Miles said the probe remained open and active but declined to comment further. Gwinnett Superior Court Judge Kathryn Schrader will step aside from hundreds of cases involving the local district attorney’s office, her attorney told The Atlanta Journal-Constitution. The announcement comes a few days after District Attorney Danny Porter filed a formal motion asking Schrader to recuse herself from presiding over any case prosecuted by his office. Porter questioned Schrader’s ability to be impartial in such cases after learning that the judge had accused him of trying to hack into her computer — and then hired a private investigator to place a monitoring device on that county-owned computer. Those steps she took are the subject of a criminal investigation by the GBI, and has Porter concerned that unauthorized people — including the convicted child molester hired to keep tabs on Schrader’s device — could have been given illegal access to the county’s larger network. Schrader has said nothing publicly about the situation but her attorney, B.J. Bernstein, issued a statement to The AJC on Tuesday. Bernstein wrote that Schrader “cares deeply for the justice system” and “respects legal due process. “For that reason, since March 27, 2019, Judge Schrader has not presided over or acted on any criminal matter handled by the Gwinnett County District Attorney’s office,” the statement said. “Due to the current investigation she has requested another Judge handle her criminal calendars and will instead continue to work on civil matters that are not part of the work of the District Attorney’s Office.”Porter has denied trying to access Schrader’s computer, saying there was “no rational basis” for the judge’s fears. He has, however, expressed deep concerns about the actions that purportedly resulted from those fears. The district attorney helped launch the GBI’s probe into Schrader and others after the arrest of Ed Kramer — the convicted child molester and longtime Porter nemesis. The agency is investigating whether a crime was committed by Schrader, Kramer, Ward or Frank Karic, the man reportedly responsible for installing the “WireShark.”Porter is now a witness in the case and has recused himself from the investigation.Schrader’s recusal, meanwhile, means a new judge or judges will have to handle the nearly 500 criminal cases over which she currently presides. Those cases are in various stages of the judicial process.It’s not clear if there will be other ramifications for the judge.Ben Easterlin is the director of Georgia’s Judicial Qualifications Commission, which oversees judicial conduct across the state. Easterlin said Tuesday he could neither confirm nor deny the existence of any complaints against Schrader, or if the JQC was involved in the matter in any way. Page created in 6.166 seconds with 20 queries.